This is a delicious soup to make, has a lovely consistency and is nice and warming on those cold winter days. Melt the butter in a large saucepan and add in the chopped onion, garlic and leeks. Sweat the vegetables off for approximately 2 minutes over a gentle heat until they are softened down. Add in the bay leaves and the chopped potatoes at this time and in their turn sweat them off for another moment or two. Season the mixture lightly at this stage. Once the soup has come to the boil, simmer for about 10-15 minutes until the potatoes have softened. Remove the bay leaves. Add some blue cheese and blitz the soup with a hand blender adding additional stock if you desire. 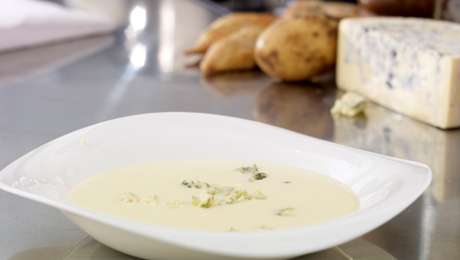 Serve the soup garnished with some extra crumbled Cashel blue cheese on top.